Jacob Emrani, a Los Angeles personal injury attorney who earlier this year generated international buzz via his #LABron recruitment effort that began in March and LeBron admittedly appreciated, has turned his sights from the Purple & Gold to Pink & White, announcing the launch of a multi-media campaign, including Television, Radio, Outdoor and Digital marketing efforts, to once again ignite the community and raise funds and awareness for breast cancer during the month of October. 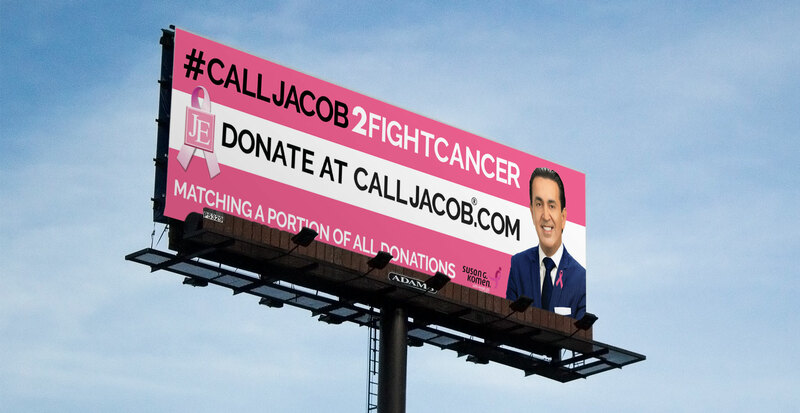 The campaign will feature the Hashtag “#CallJacob2FightCancer”. Attorney Jacob Emrani is encouraging individuals or teams to log on to CallJacob.com and make a donation. As incentive to raise even more donations, Emrani will match a portion of all donations at the end of Breast Cancer Awareness month. Emrani will also be making a large donation under the name of the team or individual that raises the highest donation amount by the end of October. In addition, Jacob is encouraging people to share personal stories via social media. The images and videos of their fight, or a loved ones battle with cancer will be featured in the law firm’s breast cancer awareness campaign. By building awareness to fight breast cancer and encourage sharing, the attorney plans to continue to foster a sense of community and strength. In promotion of the sharing initiative, Emrani will make an additional donation each time the Hashtag “#CallJacob2FightCancer” is used.